"Manyo no Uta" is an open-ended series of songs, by Tomoko Yamamoto, setting the poems from "Manyoshu" to music. The oldest waka collection is called "Manyoshu" (Manyoushu or Man'yoshu) (stems from the 8th century). This collection consists of 20 volumes of more than 4500 poems. One characteristic of the Manyoshu poems is that as many as more than 2900 poems have place names in the text. Because I am interested in composing songs with specific sceneries that I can photograph, I started composing again using two poems from the Manyoshu (Man'yoshu) collection. Stay beautiful and wait for our return, Cape Shirasaki! We shall return on a large ship with pairs of oars. Wir kommen mit dem großen Schiff und der Ruder zurück. In "Shirasaki," I have tried to evoke repeating tidal waves on the beach. Shirasaki literally means a white cape. The white cape is due to limestones. In "Waka no Ura," the sound of waves and the cranes' calls are both heard in the piano accompaniment. I have to admit that I didn't know how the cranes would sound when I composed this song, so I just invoked the cranes by repeated whole-step motion at different pitches. However, there are two possible species of cranes which the poet must have seen and heard, Manazuru (Grus vipio) and Nabezuru (Grus monacha). Both have distinct calls which are not like chirping by smaller birds. At the present Wakanoura, the cranes no longer come, but I saw a number of gray herons (Ardea cinerea), which I photographed. 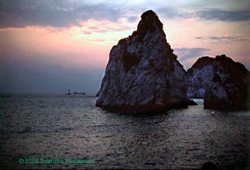 These photos and other photos from Wakanoura need to be scanned and posted. These two songs were sung for the first time publicly by Tomoko Yamamoto in a program of her Japanese songs including Shiki no Uta (a set of four songs depicting the seasons) given at Wednesday Fellowship at Second Presbyterian Church on April 2, 2003 (Margaret Budd, piano). © 2003-2006 Tomoko Yamamoto, all rights reserved.